Fallout 3 Buffout, in real life! 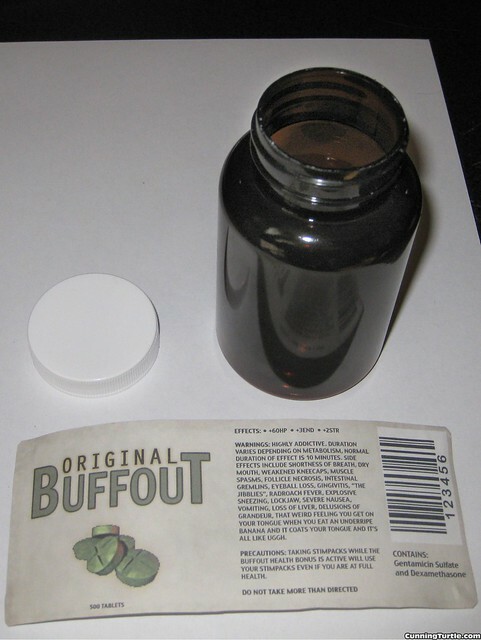 I made own my real life Buffout! It’s really easy to make and takes only a few steps. All you need is a medicine bottle and to download, print and cutout the label. I got the medicine bottle as a free sample from a site that specializes in selling plastic bottle. 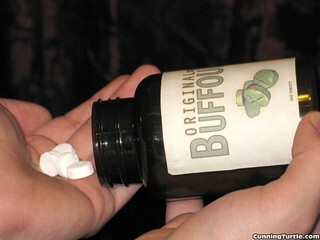 If you are going to make yourself just one or a handful of Buffouts, I recommend getting the bottles the same way. 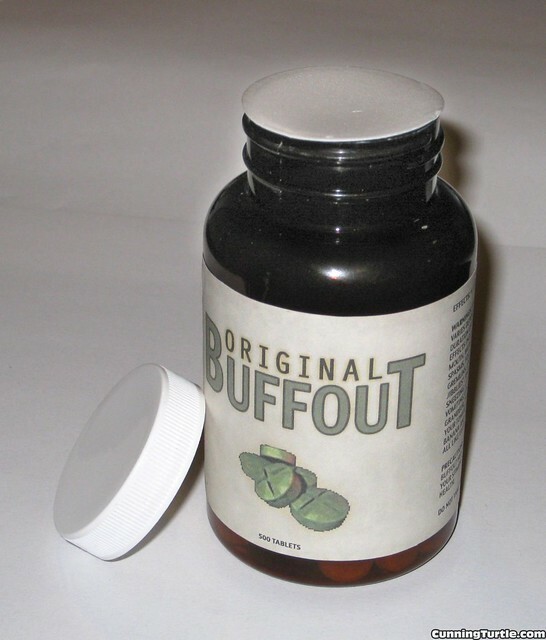 Scroll down a little until you reach the template for buffout (it’s going to be a link to a jpg file). Once you download it you’re going to have to print it out to scale. It should come out exactly 6 inches long and 2.5 inches tall. An easy way to do this is to toss the picture into Microsoft word, where it should automatically get scaled to the correct size. Now you wait. The bottle and lid should arrive at your door steps in 3 to 5 business days. This is a good opportunity to go out and buy a pack of Altoids. You’ll need them for later. Once you have the bottle all that’s left to do is stick the label on. I printed my label on regular paper and used permanent double sided scotch tape to adhere it to the bottle. A strip of tape at the start and end of the label will hold it on forever. * Note: Altoids might not actually give real life character bonuses, other than fresh breath. SO the link to the buff out label does not work. The server no longer exists. Is there a way i can get that?